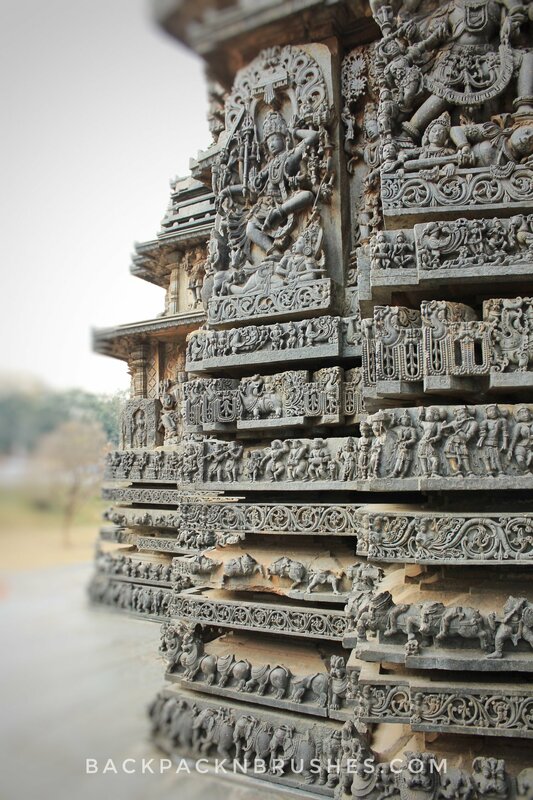 Hoysala dynasty was known for its intricate architecture and amazing workmanship. 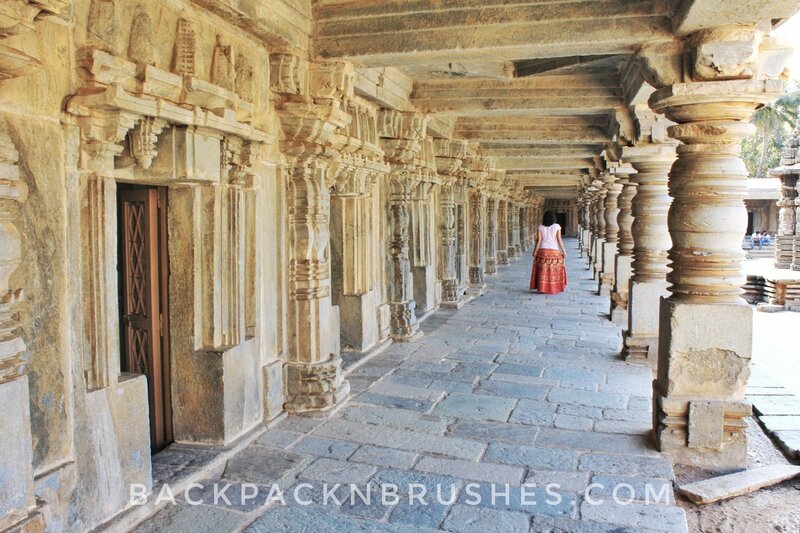 The temples literally leave you jaw-dropping and you will end up spending hours admiring them. We visited three different temples belong to Hoysala Architecture. 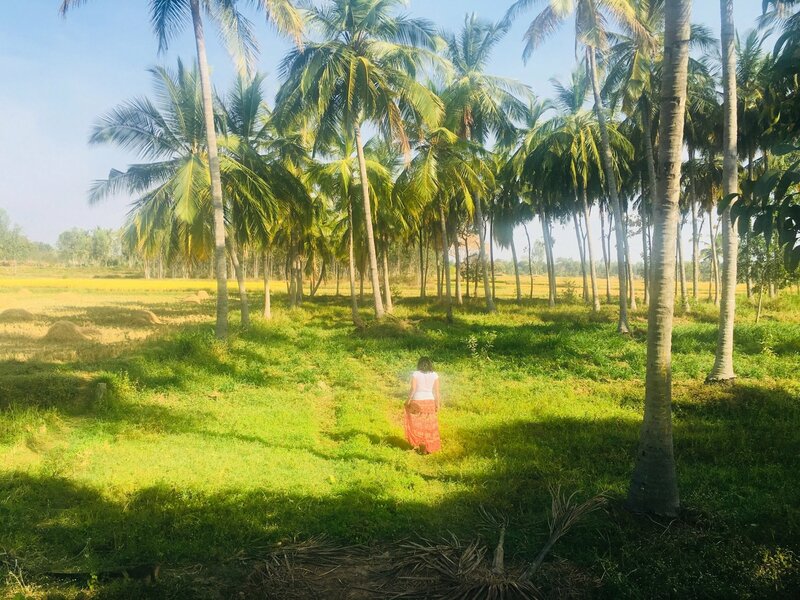 These all three were day trips from Mysuru and easily doable. HOW TO REACH AND WHAT TO EAT? While driving from Mysuru, we took the turn at Bannur. It roughly took us one hour to reach by car. There are also buses connecting to the nearest town. From there you can hire a tuk-tuk or a rickshaw. Roads are mostly single lane and in good driving conditions. When we traveled to this temple (January 2018 last week), the roads were further being repaired. We did not really eat anything here. It is not a very big town, so please get basic food if you are not accustomed to local Indian food. Public toilets are available outside of the temple. Just ask for the direction in the nearby shops and they will guide you. Opening hours for the temple are from 8:30 am to 5:30 pm. The temple is east facing, hence if you want some great pictures then please go as early as possible. 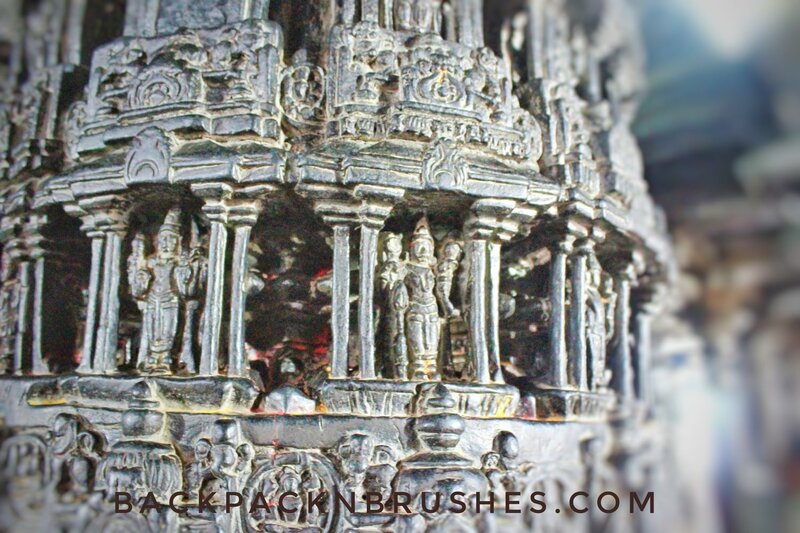 Belur temple or Chennakeshava temple was built in 1117 C.E . and took 103 years to finish. We drove towards Hassan and Chikamagalur. There are few boards too for directions so you will not get confused. 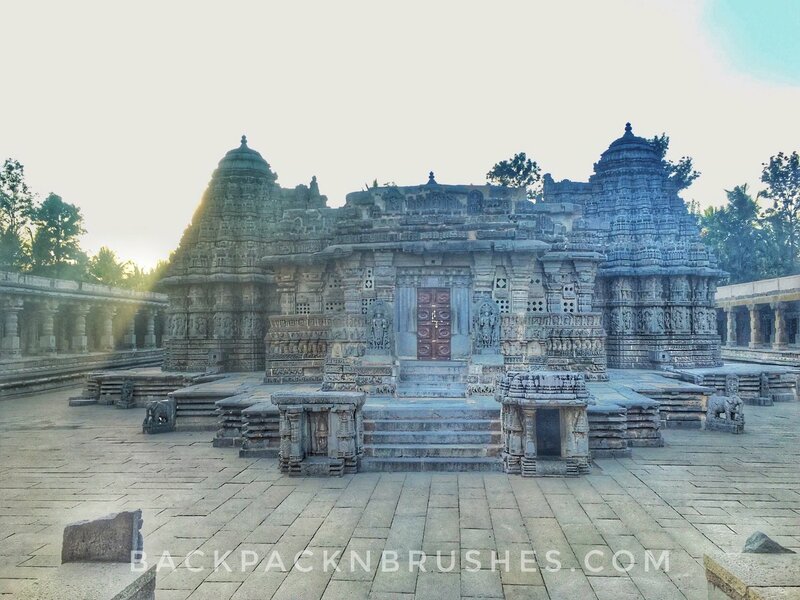 We visited Belur temple complex first and then drove to Hoysaleswara Temple in Halebidu. Halebidu was earlier known as “DwaraSamudra”. It was twice attacked by the Delhi Sultanate, and the place was deserted. Once the center of the Hoysala Kingdom, it came to be known as Halebidu, or “Haalada Beedu’, which means as ‘destroyed place’. 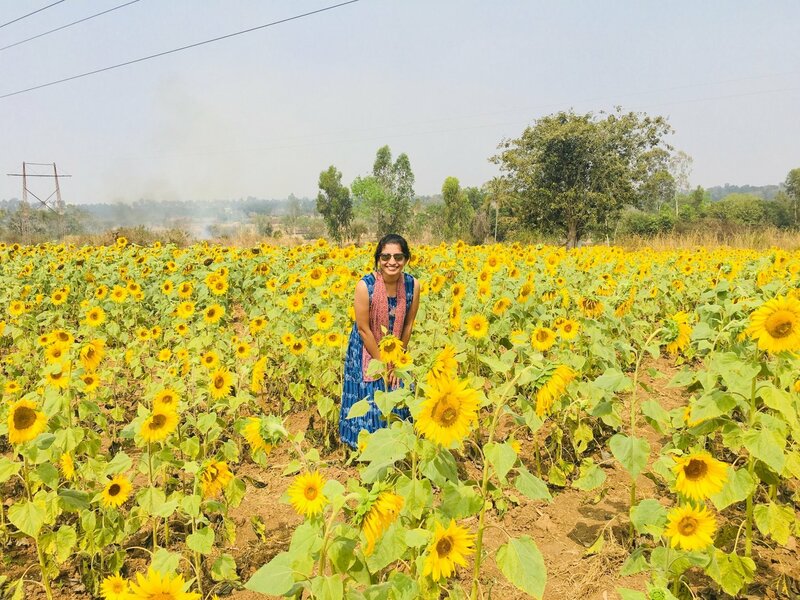 On the way to Hassan, we came across this beautiful sunflower field. This means that I had to get the customary Bollywood inspired – Yash Chopra style pic. Yash Chopra is one the renowned directors of Bollywood who revolutionized romance on screen. We are so crazy about Bollywood that our love for it is known everywhere in the world. The above temple visits were visited on different days. Car parking is available in both places and will cost you approximately a $1 or ~50Rs. It is difficult to get international cuisines here but you do get plenty of local food – Malnad style which is spicy. If you are not used to eating local food, be prepared to bring your own food. Throughout the reign of the Hoysala’s in South India, they built many temples across Karnataka dedicated to Lord Shiva and Lord Vishnu. They also built a few temples dedicated to the Jain religion as well. Their style of architecture was a mix of North India and South India styles. 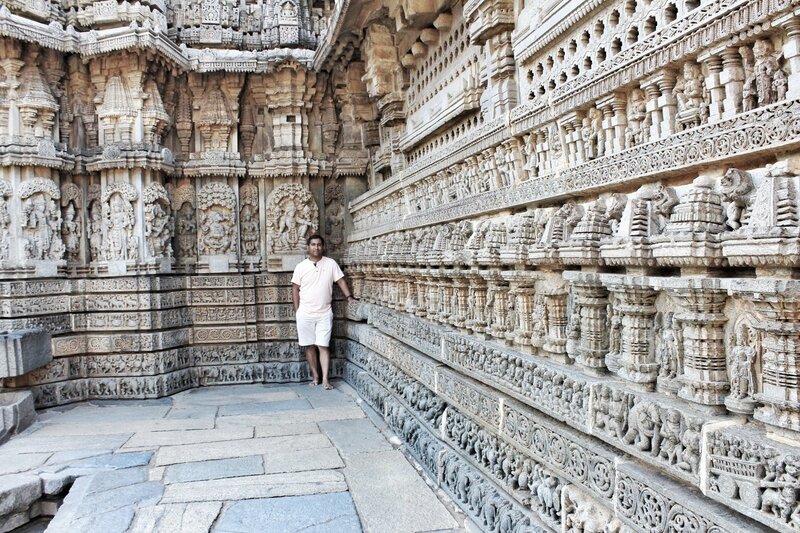 The temples have many pillars usually shaped by lathe and carved by artists for years on end. 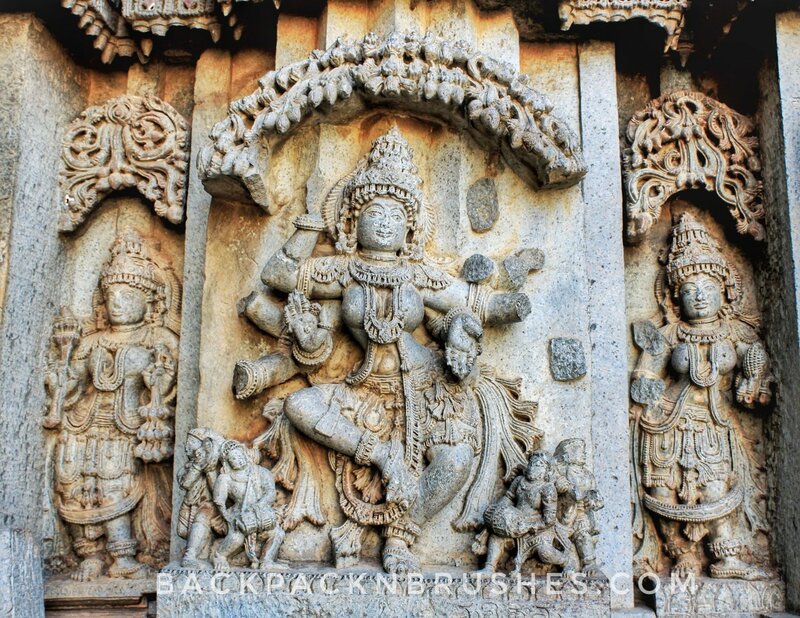 Here we have compiled some interesting facts about Hoysala architecture. 1. The pillars were never constructed using cement or any kind of binding element. They used an interlocking system for the whole temple. 2. A few pillars have 3D carvings. 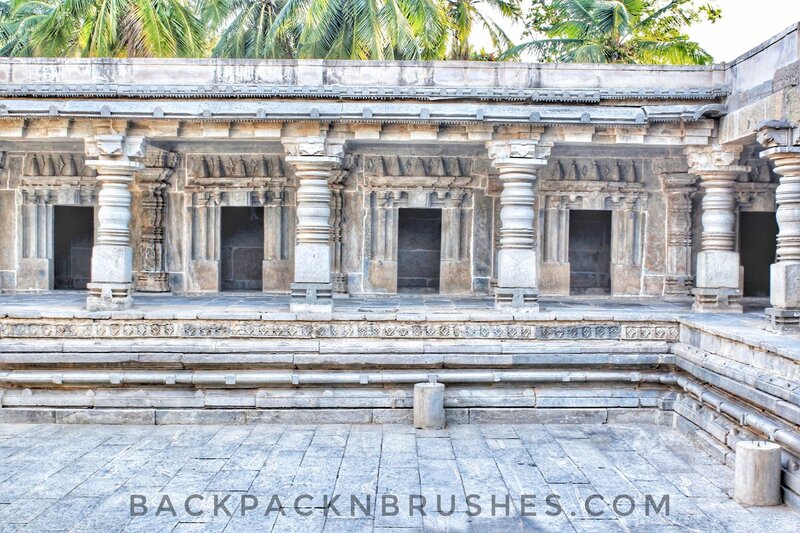 These temples were constructed some 700 years ago without the help of any advanced technology. 3. 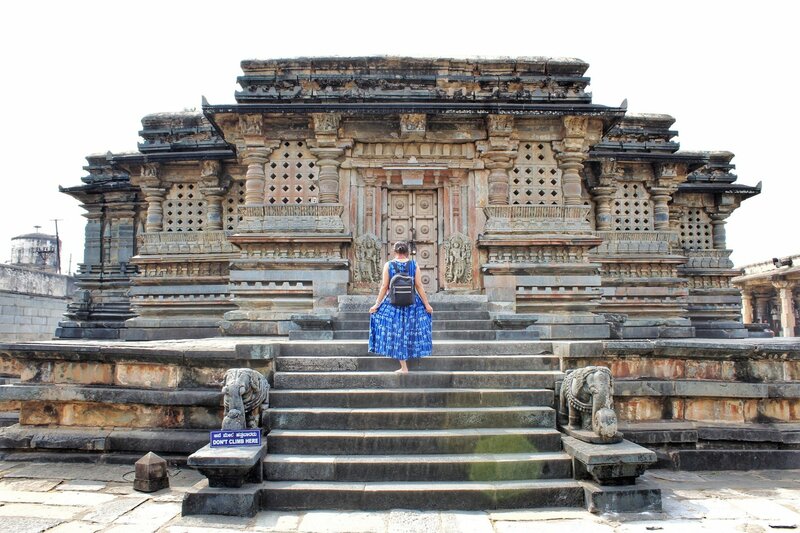 The temples at Belur and Halebidu are UNESCO sites now and UNESCO officials could not estimate the value of these temples. 4. The Hoysala temples were always constructed in a star shape as the old belief goes as ‘ a star would never get an eclipse’. 5 All the temples built during Hoysala dynasty have scriptures written in Hale-Kannada (Old Kannada language) in the stones and they have been preserved by the Archaeological Department of India. 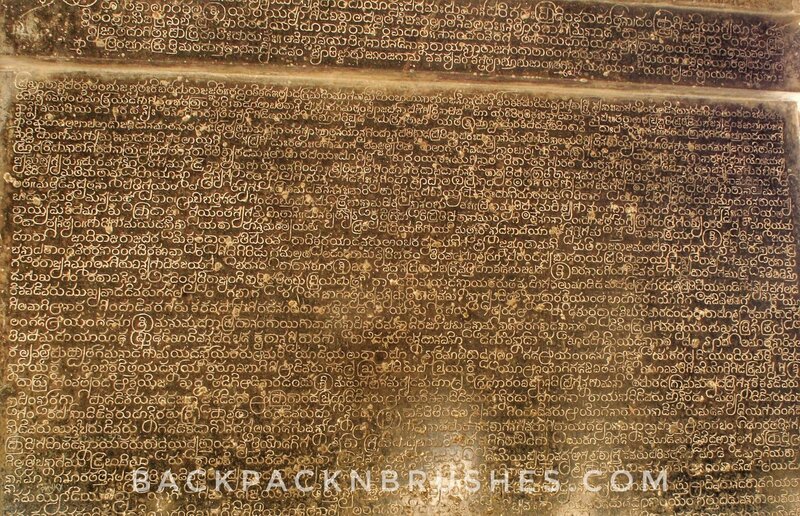 The inscriptions are engraved on to a huge slab of stone with all the details of the temple construction as well as a few other important details. 6. The ceiling of the temples will depict a different story and each square will have some information to pass on. In those days, when there wasn’t technology for connecting people or educating them, the temples played a major role in educating people though sculptures and scriptures. 7. 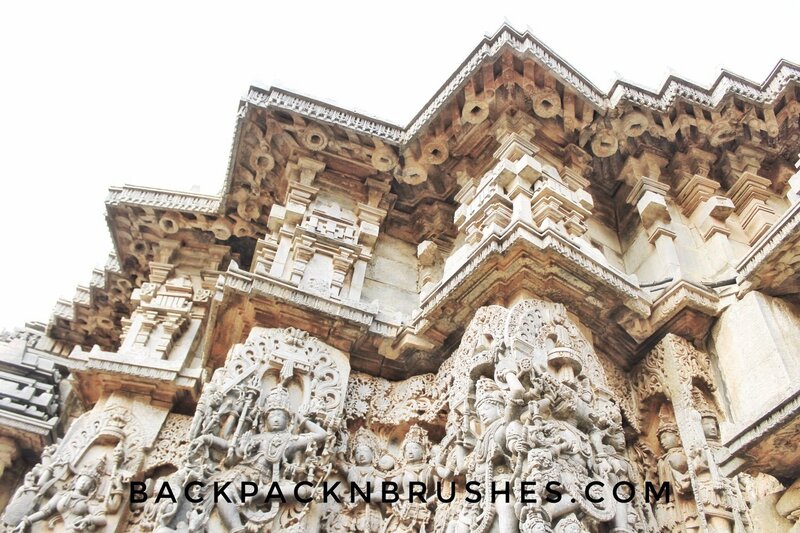 The design patterns on the outside of the temple in Hoysala architecture will always depict elephants, horses, floral scrolls, and a Hoysala symbol (a mythical imaginary animal called Makara). It is imagined to have the mouth of a crocodile, trunk of an elephant, tail of a peacock, and body of a boar. Splendid carving and sculptures all around the temple. 8. Each animal carved is totally different from the others; for example, there are around 1000 elephants carved and each elephant was carved to be in 1000 different positions. They are never in the same position. 9. 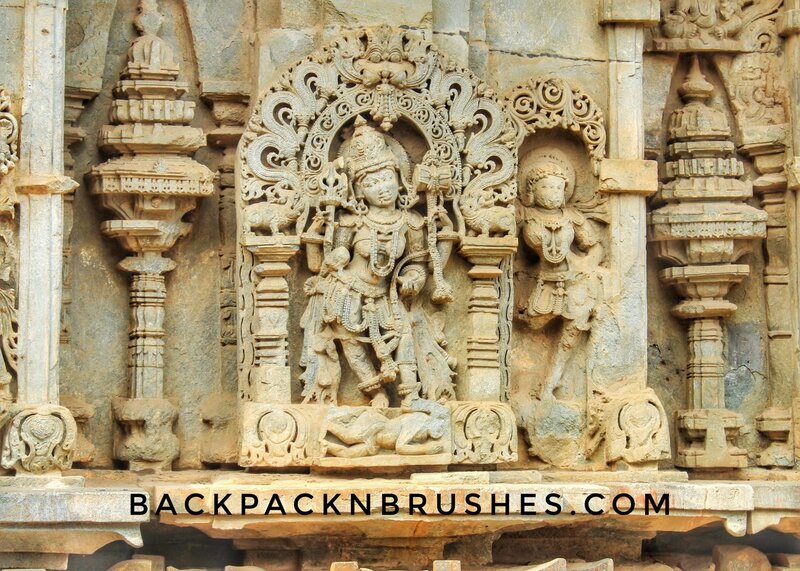 The Ramayana and Mahabharata stories are depicted throughout the outer walls in their carvings. You will also find the sculptures of the deities in different forms and poses. 10. 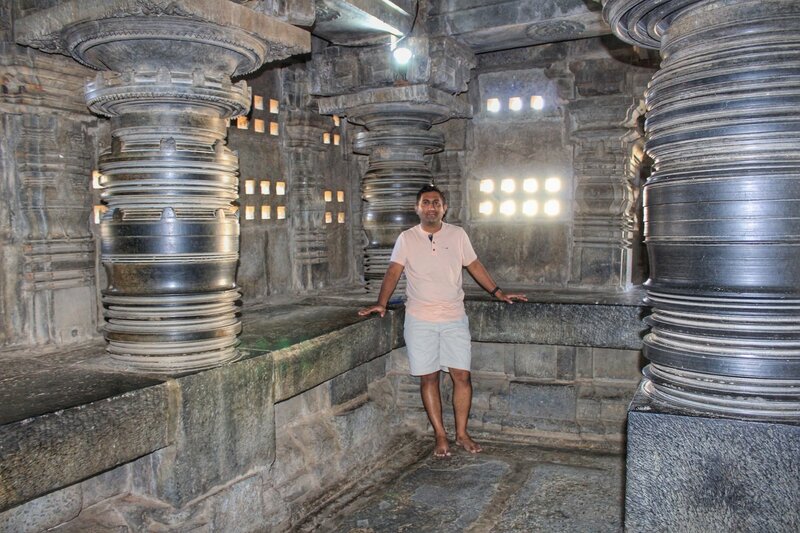 The lathe turned pillars and 16 different types of ceiling are a characteristic of the Hoysala architecture. 11. As the Mughals have attacked the Hoysala dynasty several times, they made sure to break the sculptures and tried to destroy the heritage. If you observe the above idols are damaged during the attack. 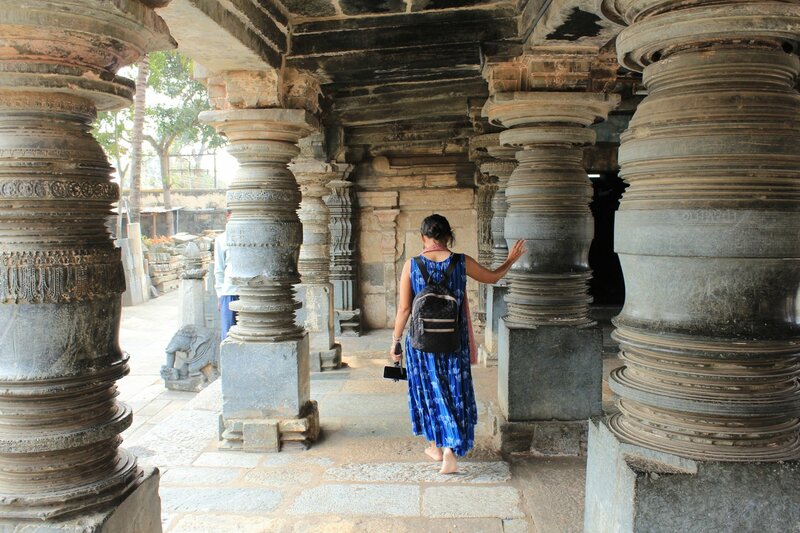 In the three temples depicting Hoysala architecture, we observed that there are a few pillars similar in design and some would remain unfinished. Below are some of the pillars present in Belur and Halebidu. Few pillars near the Sanctum Sanctorum have 3D carvings on them and these literally make your jaws drop! There was no technology present at that time, they used lathes to carve some of the designs and the rest of it was done by artisans who dedicated themselves to this job for years on end. The temple at Somanathpura took nearly 68 years to complete! The artisans were extremely dedicated and their craftsmanship is visible throughout their sculptures. All the pillars are constructed using soapstone because they are soft initially and easier to carve. As time passes by eventually exposing it to air, wind and rain, they become harder and harder and get the color which is slightly darker than the inside of the temples. Some of the pillars shown below are just a few of the many pillars present there. We were awestruck with their beauty! An interlocking system is used to attach the pillars to the ceilings and the rest of the construction too. There is no other agent such as cement as we use today. Engineering at its best, isn’t it? The artisans in those times made use of the lathe to get the shining round shape for the pillars. 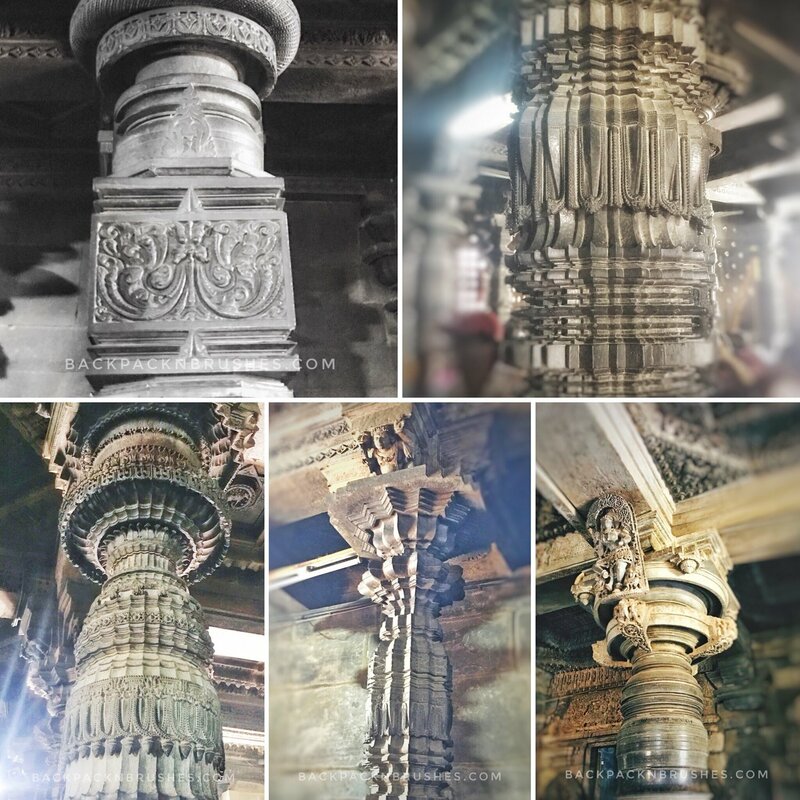 Decorated pillars carved by the artisans and also with the help of lathe. Some pillars have 3D sculptures too. As per Hindu culture and traditions, broken idols are never worshiped. This the reason why the temple at Somanthpura doesn’t have any active temple activities now. The main deities are damaged and hence this temple is more like a musuem. 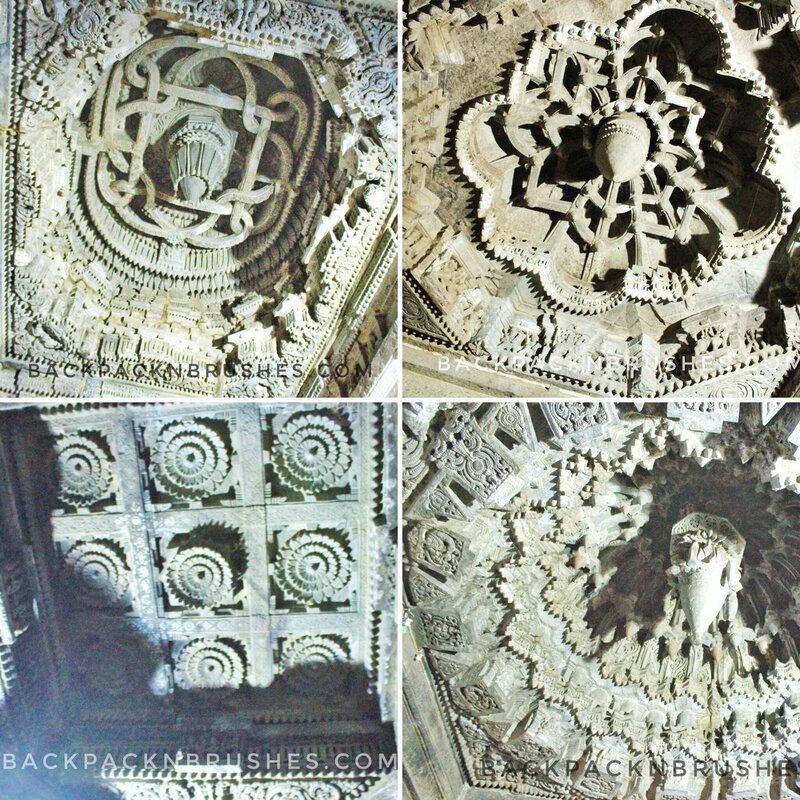 The ceilings depict different stories in Belur and Halebidu temples. You can see the amazing work below; however, our pictures do not do justice to any of it. In India, in all of the temples, please remove your shoes before you enter. There will be shops who keep your shoes safe for hardly a few cents. There are no hard and fast rules on the dress code, but usually, it is always a good idea to cover your knees and shoulder. Do remember that its a place of worship for people. Be kind! In case you have worn something and you are doubtful for as to the dress code, you can always cover yourself up using a shawl. Keep a shawl handy while traveling India. It helps all the time. In some of the temples (inside the temple where the main deity will be), there will be a ”No photography Allowed” sign. Outside you can always click as my pics you want. Outside the temples, there will be beggars who might pester you for donations, it is entirely your call if you want to donate or not. 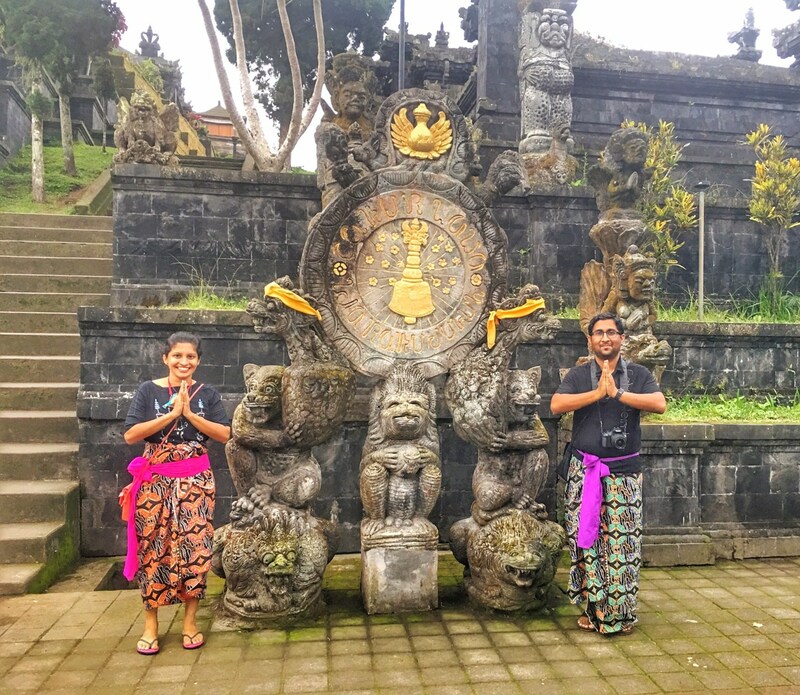 Worshipers will rotate around the main temple in a clockwise direction; this is our way of worshiping God. 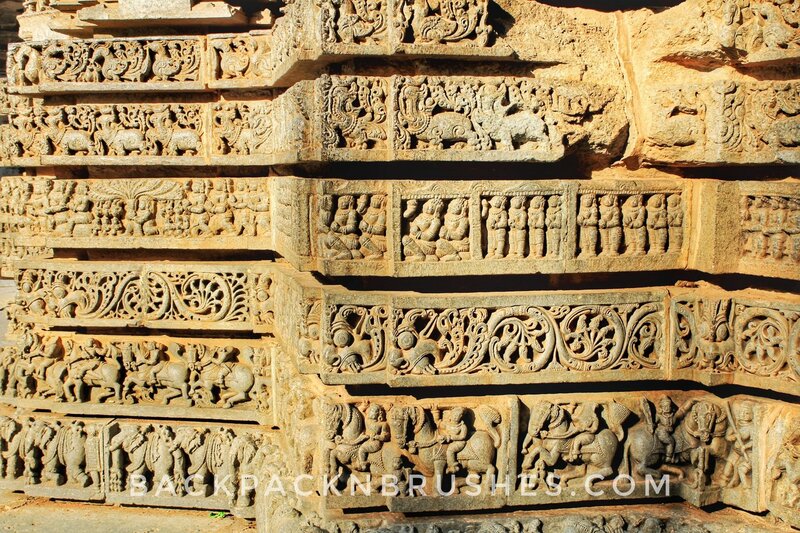 Talakaddu – While you admire the beauty of Somanathapura, you can immerse yourself in history at the famous Talakaddu. Just remember this place has 5 temples and they are covered in sand. Srirangapatna – It’s a nearby town and again here you will get to see Tipu Sultan’s palace, a river bed and a few temples. Mysuru – If you have visited Srirangaptna then how can you miss Mysuru? We recommend visiting here as well! Chikamagalur – Visit the coffee estates in Chikamagalur. They are one of the scenic places of Karnataka. Mulyangiri / Kemmangundi treks – There are many great trails if you love to do some hiking. ‘Mahamastaabhisheka’. Its a huge festival for Jain followers but many other people also do come here to witness this. WHAT TO TAKE AS SOUVENIRS? 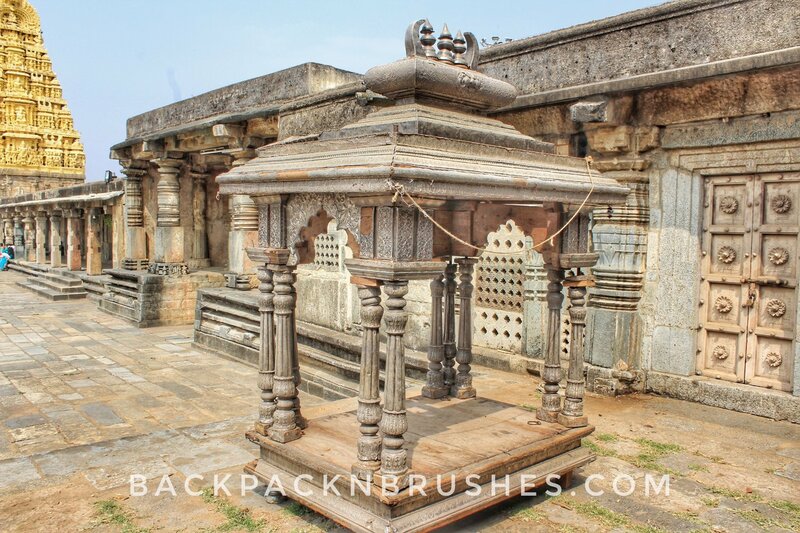 Outside the Halebidu temples, you will find locals selling soapstone miniatures of the temples or famous spots of India. We got a cute little mortar and pestle for our kitchen for less than 2$ or 150Rs. Mortar and pestle is one the important kitchen devices in India. We mainly use it for crushing or grinding our spices. Thank you for reading! If you have any questions / suggestions / feedback you can comment below. I would love to hear back from you. I am Priya and he is Praveen. We are currently based in India – our home country. Our travel stories always filled us with adventures and these have become our treasured memories now. While we were in a long distance relationship living in separate cities in the US, we learned how to travel hack as it was expensive for us to meet alternate weekends. After exploring California, Nevada, Utah, some parts of Idaho and Wyoming we both decided to jot down our travel memories and all of our road trips. This is how this blog has come into existence. We have tried our best in documenting every detail of our trips and this is more like a personal journal for us. Thanks one and all for being so patient and reading our stories.